Cedar Falls, IA – John Bermel claimed the Junior Academy Sr. Stroke Play Event at Pheasant Ridge on June 13th. The Junior Academy Stoke Play and Senior Stroke Play events were played in conjunction with the 38th Annual Junior Academy. Bermel carded a bogey-free round with five birdies, including two-in-a-row on Nos. 17-18 to finish at 5-under-par 67 at his home course. The host professional bested Jeff Smith by four strokes. Smith recorded two birdies in the round to finish at 1-under-par 71 and take second place. Larry Castagnoli and Stephen Hutton finished T3 at 1-over-par 73. Castagnoli recorded his only birdie on the par-5 8th hole. He then went on to card a bogey-free back nine. Hutton registered four birdies in the round, two on the front nine and two on the back nine. 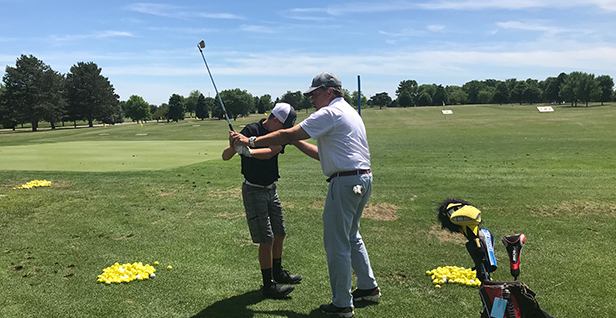 The Iowa PGA would like to thank John Bermel, PGA for hosting the 38th Annual Junior Academy and both Iowa PGA events this week. The Iowa PGA would also like to thank all the Iowa PGA Professionals that assisted with instruction at the Academy this week. The next Iowa PGA event is the Wild Rose Casino & Resort Pro-Am at Copper Creek Golf Club on Monday, June 18. Registration for this event closes tomorrow (Thursday, June 13) at 11:59 p.m. Click here to register. Teams in this event are comprised of one professional and three amateurs.